Why do we need cosmetic dentistry? What are some common cosmetic dental treatments? Which cosmetic dental treatment is best for me? Cosmetic dentistry in San Clemente, Orange County. Whether you have chipped teeth, stains, unsightly gaps or other aesthetic concerns, cosmetic dentistry has a solution for you. Cosmetic dentistry is the art and skill of improving your smile for a a more beautiful appearance. A cosmetic dentist is one who can help you achieve the smile of your dreams. Cosmetic dentists achieve this by using a combination of teeth whitening, porcelain veneers, clear aligner technology and other cosmetic treatments. Whether you have chipped teeth, stains, unsightly gaps or other aesthetic concerns, cosmetic dentistry has a solution for you. With advancements in technology, cosmetic dentistry is easier and more affordable than ever before. To learn more about cosmetic dentistry, contact us or a cosmetic dentist near you to schedule your consultation. Poor diet, teeth grinding, smoking, medical conditions and wear-and-tear damage our teeth over time. Consuming foods and drinks like coffee, tea, wine, berries and many food additives turn our teeth yellow. Acidic food items like lime, lemon and carbonated sodas can wear out our tooth enamel and make them appear dull looking. Chewing hard objects like ice, nails and nuts can put chips and cracks onto our teeth. There are lots of items that affect our teeth and the damage adds up. Teeth grinding is very common among the population. Many of us grind our teeth at nights or clench throughout daytime. Grinding exerts a ton of unwanted forces unto our teeth which further harms and damages them. Tobacco use has a huge impact on the health of our teeth and gums. 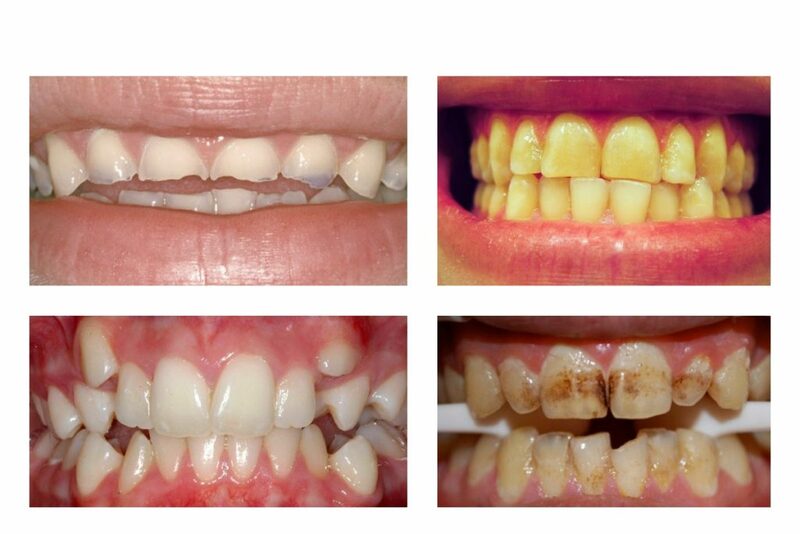 Not only does smoking cause our teeth to turn yellow but it leads to gum disease and bone loss. Long term smokers damage both the appearance as well as the health of their teeth. There are plenty of medical issues which adversely affect our oral health. Digestive problems, systemic diseases and many other medical conditions can indirectly damage our teeth. Additionally, a long list of medications which cause dry mouth further impact our oral health. The average person chews 250,000 times a year which is a lot of chewing! Chewing alone places lots of pressure onto our teeth which causes them to crack and damage with time. Those with a strong bite or orthodontic issues place even more forces on their teeth and further damage them. These factors all add up to make our teeth look less attractive. Fortunately, cosmetic dentistry can help fix these problems. Cosmetic dentistry offers a solution to reverse the damage to our teeth and bring back the youthful and beautiful smile which you’ve been missing! What are some common cosmetic dentistry treatments? Porcelain veneers brings your teeth back to their original, youthful shape and color. Porcelain veneers are small covers placed to protect and restore your front teeth. Placing porcelain veneers brings your teeth back to their original, youthful shape and color. With porcelain veneers you can instantly transform your smile and to a whiter and brighter one. Porcelain veneers shave off years from the appearance of your teeth to give your the perfect smile you’ve been wanting. Invisalign clear aligners, your dentist can fix mild-to-moderate teeth crowding, overbites and teeth gaps. Think of Invisalign as basically cosmetic orthodontic braces. Wearing Invisalign clear aligners will move your teeth without the need for traditional metal and wire braces. Invisalign aligners are easy to wear and barely noticeable which makes them ideal for people with an active lifestyle. With Invisalign clear aligners, your dentist can fix mild-to-moderate teeth crowding, overbites and teeth gaps. In most cases, Invisalign clear aligners give you a straighter smile within just a few months. Whitening your teeth is one of the most popular and affordable of all cosmetic dental treatments. If you feel that your teeth are yellow, there’s a chance a simple teeth whitening is all you need to transform your smile. Professional teeth whitening treatment can brighten your smile by several shades in as little as one hour. Plus, teeth whitening is easy, affordable and safe when supervised by your dentist. Of course, there are many other cosmetic procedures which help your dentist achieve the desired final outcome. Treatments like enamel contouring, gum contouring, Lumineers, gingival grafts and many more procedures are also used to fix aesthetic concerns. Talk to your cosmetic dentist to see which treatments are most suitable to your needs. What cosmetic dental treatment is best for me? Each smile is unique and different and the ideal cosmetic treatment depends on different factors. For instance, what your teeth currently look like, what outcome you expect and how much time and money you have for your treatment. The best way to determine the best course of treatment is to request a cosmetic consultation from your dentist. During your cosmetic consultation, your dentist will review all different treatment options. This will help you decide what is best for your specific needs. With so many different options, only you and your dentist can determine what is going to work best for your needs. Dr. Jazayeri has performed hundreds of simple and complex cosmetic dental treatments.